Basically a smoothie, whether green, red, or orange is just a fruit smoothie with fresh greens added. They are easy to make, exceptionally nutritious and one of the best ways to increase your greens intake significantly. 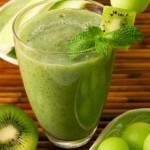 In fact, the author of TheAlternativeDaily.com, Ms Danica Collins, insists that a smoothie a day will not only keep the doctor away, but add years to your life! Not only are they highly beneficial for their high vitamin content in detoxing your whole body, but they help you to control your weight. 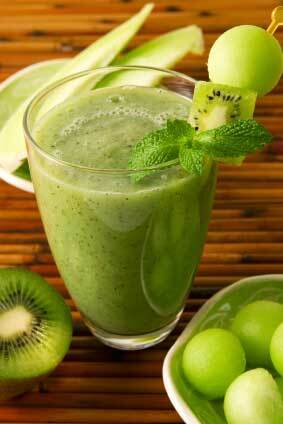 Drink a smoothie every morning and be sickness free and add years to your life! You can use almost any fresh vegetable, fruit or powered greens when fresh produce is inaccessible. Depending on your taste, you can substitute various fruits for just the right flavor. The more of these that you drink, you will eat less non-essential food which will help you lose weight. Another vital thing to remember is that you are “drinking” your breakfast, which, has the nutrients already dissolved in liquid for you. Consequently, less energy is used to absorb these delicious nutrients. They are absorbed easily by the body so less nutrients get wasted. Plus you will be removing all the toxins that are raging throughout your body, which again reduces weight. Then you will notice you have much more energy, less fatigue, which will aid in developing less stress. You can use any blender to blend all of the ingredients below. However, be certain not to add too large of a piece of vegetable or fruit, or too much at one time, or else you run the risk of burning up your blender. If you are careful and blend a little at a time, you should be able to enjoy your smoothies for years to come. First, add the water. Then fill your blender half way with fruit. Blend these together first before adding vegetables, so you don’t overwork your blender. Blend for at least one minute, or until fairly smooth. Next add your vegetables. Depending on the power of your blender, you may need to add slowly while blending. Blend for 1-2 minutes, or until very smooth. If at all possible, using filtered water and organically raised fruit and greens are best. But just using what you have available, is much better of choice, than not mixing this delicious drink at all! Fruit selection, berries and apples are more important to select organic than are peeled citrus and bananas. Always chop the fruit and ginger to smaller size chunks before adding. The orange and lemon can be juiced or just peeled with seeds removed. Apples and ginger can be left unpeeled for extra nutrients. This basic recipe can be made into endless variations based on your own taste and the availability of ingredients. You can use any fresh or frozen (unsweetened) fruits and any greens. Nutrient-packed herbs like parsley and cilantro are also great additions in your green smoothies. Broccoli is by far the best greens to use, but romaine are a good choices to try first as they are more mild than kale or beet greens. Carrot tops and dandelion greens are very nutritious and deeply cleansing greens. Try adding avocado, celery, tomatoes, carrots or beets. Add spirulina, hemp powder, ground flax, bee pollen, maca, or other superfoods to boost the protein and the nourishing/cleansing effect of your green smoothies. When you first make one of these delicious drinks, it will be better to have more fruit than vegetables ratio for taste purposes only. Once you have mastered your unique recipe, make it your own, gradually increase the vegetable content over time as this will be the best possible drink for your body. The best time to prepare one of these fabulous drinks is in the morning, and consumed on an empty stomach. Many people have found that if you drink one of these with a meal, they will create gas or bloating. This is normal because of the vast amounts of vitamins and minerals these drinks have. These smoothies are very nutritious and deeply cleansing. People often detox, lose weight or notice improved skin and increased energy after simply adding green smoothies to their regular diet. Drinking them daily is a great step toward clearing up your toxicity symptoms.